International Pizza School. Every week we have amazing students from all over the world, They come from great distances to fulfill their dreams and learn the art of pizza. They to come and train with us at the International Pizza School of New York ! I guess you can say we are an international Pizza School with students from every continent, it’s truly amazing!The truth is we love them all and their all great people of all types of beliefs and cultures and incredible stories All with a ton of passion and really brave folks who want to go out despite anything and make their dreams a reality . They bring such interesting stories about their lives, their towns, and cultures, They travel from places I know I will never visit this lifetime, but I do, I know that when they leave, I will always have a friend and be able to enjoy a great pizza and conversation and enjoy their success . I guess we are changing the world in some little way, sharing a common bond, and a passion for the art of pizza. I would love to say “that it is our mission to have the whole planet covered with great pizza shops and good people who love the art and share the love.” I guess you can say “I’m a dreamer” but dreams lead to realities and anything that can contribute to peace a better world happier people , even for a moment can make a difference. ,To me making that difference is through pizza and that is fantasist ! 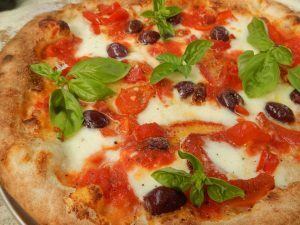 We all love pizza and it’s a common bond worldwide as with all great food. It’s truly hard to argue while enjoying a great pizza! So everyone enjoy, and perhaps the peace will spread and the world will be a better place!